Everything Dinosaur has another super, dinosaur themed giveaway. We have a copy of the brand new book by Professor Michael Benton “The Dinosaurs Rediscovered” and we are giving you the chance to win it. 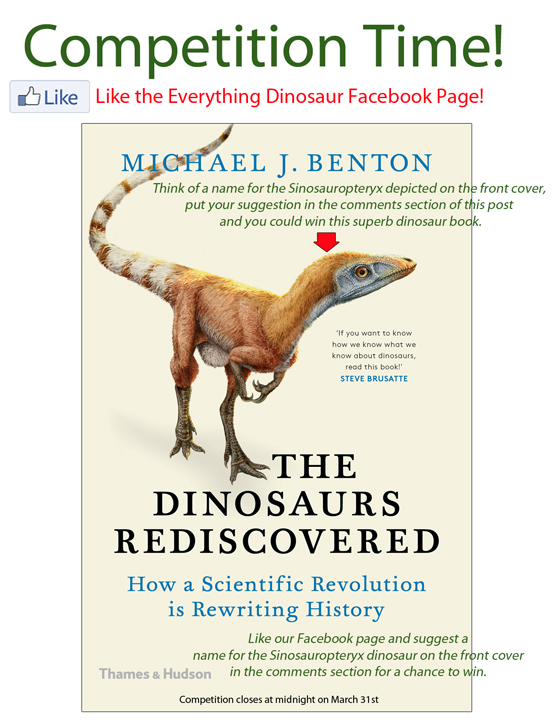 Win a copy of “The Dinosaurs Rediscovered” by Professor Michael Benton. Aimed at serious dinosaur fanatics as well as general readers with an interest in science, this latest publication by the highly respected Professor Benton provides an authoritative account on how our knowledge about the Dinosauria has changed in recent years. This really is a must have! Make room on your book shelf for this excellent publication. Even better, you can win a copy courtesy of Everything Dinosaur! All you have to do is “Like” Everything Dinosaur’s FACEBOOK page, then comment on our dinosaur book competition post giving a name for the superb Sinosauropteryx dinosaur model depicted on the front cover. The Sinosauropteryx illustrated by Julius Csotonyi is stunning, but he/she needs a name! We will draw the lucky winner at random and the Sinosauropteryx naming competition closes at midnight on Sunday 31st March. Good luck! The Everything Dinosaur name a Sinosauropteryx competition runs until midnight Sunday 31st March 2019. Exciting news for dinosaur fans and model collectors, the first batch of the new for 2019 prehistoric animal models from CollectA are due to arrive at Everything Dinosaur next week. Stocks of the Borealopelta, the Deluxe 1:40 scale Carnotaurus, the super-sized pterosaur figure – Caiuajara and the 1:20 scale Deluxe Edaphosaurus are all on their way. In addition, the new for 2019 set of mini prehistoric animal models are also due to arrive at the same time. The first batch of new for 2019 CollectA prehistoric animal models are on their way to Everything Dinosaur. The picture above shows the first four models coming into stock along with the mini prehistoric animal model set which will feature an additional twelve figures. Back in November, when we were given the official go ahead to discuss the 2019 CollectA offering, Everything Dinosaur team members posted up the first pictures of these hand-painted models. They were very well received. Many manufacturers focus on just a handful of figures, but the CollectA range is huge with a wide variety of prehistoric animals (and plants) represented. Over recent years the company has introduced several sets of mini-prehistoric animal figures. Later on this month, Everything Dinosaur will be receiving stocks of the prehistoric animal model set, or as we at Everything Dinosaur like to call it “the synapsids plus one”. All the figures are synapsids, with the exception of the mini Kelenken model, which as a bird comes from the Archosaur lineage of diapsids. The CollectA box of mini prehistoric animal models which is going to be available in 2019. Twelve prehistoric animal models. Coming into Everything Dinosaur very soon. How many of the twelve models in the set can you name? As a clue and to give you a start, we have given you the name of one already. The CollectA Edaphosaurus model. If you look at the top right-hand corner of the photograph you can see the CollectA Carnotaurus coming into attack! We are looking forward to getting all these new models into stock next week. Rest assured all those dinosaur fans on our reserve lists, as soon as the models come in we will be emailing you to let you know that the figures are available and that we have set one aside. Recently, Everything Dinosaur team members set up a poll on the company’s Facebook site asking dinosaur fans and model enthusiasts which they preferred, feathered Theropod dinosaur models or models of Theropods with scaly skins? The results are in and in this particular survey it is the feathered Theropod dinosaur models that have come out on top. It’s a feather in the cap for feathered Theropod model designers. Which Type of Theropod Model do you Prefer – Feathered or Scaly? In Everything Dinosaur’s survey of dinosaur model preferences with collectors it was the feathered Theropods that triumphed. In this poll, 59% of respondents opted for the feathered dinosaur model option. Step back ten years and virtually all the models of fearsome, carnivorous dinosaurs such as Allosaurus, Acrocanthosaurus and Tyrannosaurus rex were entirely devoid of a feathery integument. Many mainstream manufacturers still prefer to produce non-feathered figures, an example being Schleich of Germany. Comparing Schleich Tyrannosaurus rex dinosaur models through time. Other model manufacturers have chosen to reflect current scientific thinking and produce feathered Theropod replicas, including fuzzy T. rex dinosaur models. Schleich has moved towards introducing feathered Theropods, a number of dromaeosaurids have been introduced into their range over the last few years with varying degrees of feathery integumentary covering. A model of the Late Triassic, fast-running predator Tawa (T. hallae), which was introduced by Schleich in 2018, has a feathery crest on its head and a “tuft” of feathers on its tail. The Schleich Psittacosaurus, a model of an Ornithischian dinosaur, which was also introduced by Schleich last year, had feathers, reflecting the current scientific thinking. In addition, the Oviraptor and the Therizinosaurus, both examples of Theropod dinosaurs have feathers, perhaps it is just a matter of time before Schleich introduces a feathered Tyrannosaurus rex. Schleich Prehistoric Animal Model Releases in 2018 – A Trend Towards More Feathers? New Schleich prehistoric animal models (2018). The new Schleich models introduced last year showed examples of feathery integumentary coverings. In the Everything Dinosaur poll, 59% of respondents voted in favour of feathered Theropod dinosaur models, whilst 41% stated that they preferred scaly Theropod figures. A big thank you to all those who participated. We appreciate all the comments that were posted up and the “shares” of our Facebook post too. The Everything Dinosaur Facebook page provides status updates, photos, links to news stories and blog posts as well as lots of prehistoric animal model features. Visit Everything Dinosaur on Facebook. Everything Dinosaur has won the Feefo Gold Service award, an independent seal of excellence that recognises that the UK-based dinosaur company delivers exceptional customer service as well as exceptional prehistoric animal models. Feefo product and service ratings are provided by real customers, Everything Dinosaur has over 600 customer reviews and comments posted up on its award winning website. Everything Dinosaur has won for the second year in a row, the top award from Feefo. We even got sent a certificate to prove it. The accolade was created by Feefo. Trusted Service is only awarded to those businesses that use Feefo to collect genuine reviews and comments. Those organisations that meet this high standard, based on the number of reviews collected, and their average rating, are recognised with this award. It is regarded as a badge of honour, this accreditation remains unique, as it is based purely on the interactions with real people who purchase from Everything Dinosaur. As all reviews are verified as genuine, the accreditation is a true reflection of a Everything Dinosaur’s commitment to outstanding service. Feefo awards top marks to Everything Dinosaur. To win this prestigious award, a company must meet the criteria of receiving at least fifty reviews between January 2018 and December 31st 2018, with a Feefo customer service rating of between 4.5 and 5.0. At the moment, Everything Dinosaur has six hundred reviews posted up on-line, over 98% of them are 5-stars. Over the next few months, Everything Dinosaur will be introducing new prehistoric animal models from Papo, Safari Ltd, CollectA, PNSO, Rebor, Mojo Fun and a number of other organisations. For a company that specialises in dinosaurs, there is no sign that Everything Dinosaur is heading for extinction. Customers can now be notified automatically when a product is back in stock at Everything Dinosaur. The award winning dinosaur and prehistoric animal merchandise retailer has further enhanced its support for website visitors by adding, simple to use back-in-stock notifications to all its products. If a product is out of stock, then customers have the option to join a waitlist for this item, when it is back in stock, they will automatically receive an email letting them know that this item is available to purchase. Join the waitlist and be automatically emailed as soon as the item is back in stock. Simply click the “Join waitlist” link (arrowed and underlined in this picture). In the picture above, the PNSO Basilosaurus (Age of Dinosaurs), is currently out of stock, some more of these popular, large prehistoric whale models are coming in soon and by clicking the “Join waitlist” link visitors to this page will be automatically emailed when the figure is available again. Customer visits a product page on the Everything Dinosaur website and discovers that it is out of stock. If that customer wants to know exactly when it is going to be available again – simple click the “join waitlist” link and if requested provide a contact email address. When more of these items come into Everything Dinosaur’s website, as soon as the inventory is updated, an email will be sent alerting the customer that the item is back in stock. When the item is back in stock at Everything Dinosaur, customers will automatically receive an email informing them. When the customer gets the email alert, all they have to do is to click the handy product link included in the email and they will be directed to the product page on the Everything Dinosaur website. Customers that have created an account at Everything Dinosaur can easily review and edit their own waitlists. Once logged into to their personal account pages, a customer can click on the “Your Waitlists” link in the left margin of the account dashboard and simply edit the product waitlist information in just a few taps of the keyboard, or mouse clicks. Easy to manage your own waitlists. The link to the personal waitlist information is arrowed and underlined in red. Users can manage their own waiting lists and all products that they have an interest in can be viewed on the “Your Waitlists” tab on their account page. All products can be conveniently managed in one place. It takes seconds for visitors to join a product waiting list and they can then relax knowing that they will be automatically emailed when the item comes back into stock.